The Tour de France 2013 winner Chris Froome is Kenyan-born British and he says that he wishes to inspire young cyclists from Africa. To celebrate the future diversity in this sport, I feature this mellow coloured yet crisp stamp from Togo. By the way – it is a terrible choice of picture in the BBC article – is it only me that thinks so? There is another set on the Olympic Games, designed by Sir Paul Smith. I like the top one the best. As the designer stated in the presentation pack, they are positive and colourful – but I suspect that he did not take a long time to research and design them, unfortunately… The in-house design team was perhaps shocked by the colour restriction and smallness of what they had to design – even so, for example, the stamp on Archery issued in 2009 has a similar and better composition. Anyway, they are cheerful and pleasant if you use them on an envelope and a post card, as their colours are sophisticated. Bradley Wiggins, Sir Chris Hoy, Jason Kenny, Laura Trott and Victoria Pendleton… ‘Team Britain’ is producing a lots of Olympic gold medalists in cycling. The Olympic velodrome is full of spectators everyday, sending huge applause to the athletes. I like this stamp from Czechoslovakia, on the Olympics from 48 years ago – which was held in Japan. Carefully planned intaglio engraving with 4 colours. The 1964 Olympics was a really big thing in Japan, as it was a symbol of reconstruction after the Second World War. There is an exhibition at the Embassy of Japan in London, ‘TOKYO 1964‘ until 7 September. The five colours of the Rainbow Jersey – Blue, Yellow, Black, Green and Red – are representing five continents. And yes, I finally realise that they are the same colours to make Olympic symbols, which was designed in 1912. Now I learnt that each colour represents Europe, Asia, Africa, Oceania and North & South America in that order. 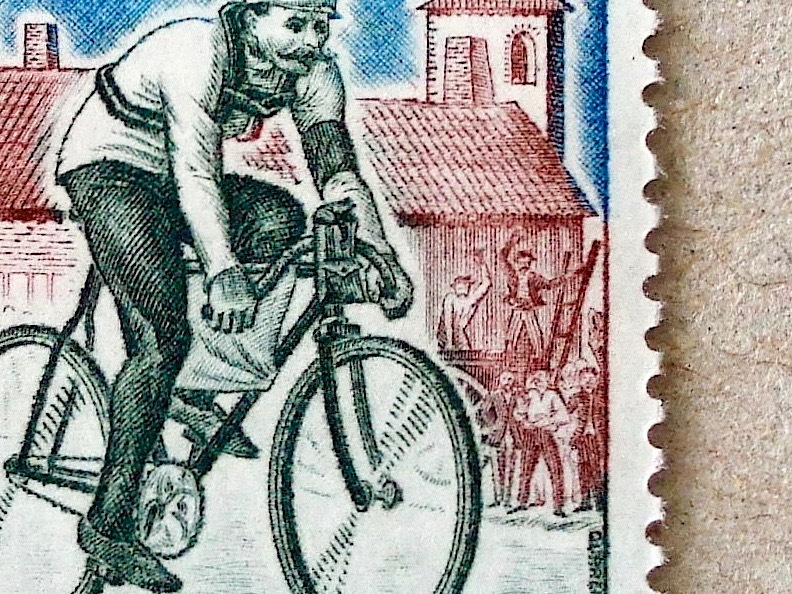 This stamp shows a track race, nearing the finish – the sprinter in front is a little behind the other – but for sure, he will be the winner as the other racer is distracted by the speed of the guy in the Czech national jersey. There is another stamp on the theme of rainbow colours and cyclocross. This time, intaglio printed Black plus three colours are used – green is made with Yellow and Blue, Light Blue is made by dots of Blue and the Grey… oh, no, looks like Grey, but is Silver. Two years before their Gentle Revolution, the Post Office had a generous budget for popular sports of the country. I like these Czechoslovakian intaglio stamps with gravure colours added – simple and free minded drawings. In international cycling events, you see a rare few athletes wearing this jersey – 5 coloured stripes on a white background. They are called Rainbow jerseys and only World Champions of the time are allowed to wear them, and only in the discipline in which they won the Championship. This stamp shows a racer Gustav-Adolf Schur of East Germany (via), who was twice the winner of the World Road Race Championship in 1950s. Those racers look proud of wearing the Rainbow jersey, but they are also fighting against the ‘Curse of the rainbow jersey‘ – the champions are always challenged by competitors. It was interesting watching the Track Cycling World Cup highlights on TV this past weekend. Several athletes mentioned that they were supported by the spectator’s cheers a lot, especially when they were almost burnt out towards their goal. It seems that cheers make a difference to achieve good competition and new records. This stamp is showing a lot of spectators in a velodrome – although their faces are a bit expressionless… I featured another stamp, which is showing spectators alongside the road to support Tour de France racers – in this case, they are more animated with their arms raised. For the last three days we have been watching the Track Cycling World Cup, which was held at the new Olympic Velodrome in London. It seems the velodrome is a really fine piece of architecture and the audience there were very excited to witness great performances, especially by the British racers. This set of stamps are delivering the atmosphere of the indoor velodrome well, also the tension and speed of track cycling. Keirin, a type of racing originating from Japan is now one of the official event in the World Cup and a pacer, on a Derny motor bike is the peculiarity of that race, although the stamp above actually shows another type of motor paced racing where each racer is paced by their own motorbike. Back in 1963, these stamps were sold to raise supportive fund for Belgium cyclists to be at the Tokyo Olympic in 1964 (via Va-lo:Vé-lo ). The fund might help the Gold Medal of 1000m time trial in the Olympic. The last day of the Tour de France is traditionally peaceful and friendly – until a few laps before the goal. All the team members of the winner and lots of others wore yellow sun glasses this year, as if they praised everyone’s courage. Yes, riding through 21 stages is already a huge achievement. These stamps are celebrating the 15th Peace Race, which started in 1948 to recreate a friendly reunion between Czechoslovakia and Poland, then extended to Berlin in 1952. ‘Peace’ in different languages shows how international the race was already in 1962. I forgot almost – but the right hand side top corner of this stamp below is my blog icon picture. Stage 20 of Tour de France was the sole individual time trial. A lot of solitary battles on the 42.5 km route. Cadel Evans became the first Australian winner of this historic race. He was absolutely tuned into winning – as if the God of speed was with him. 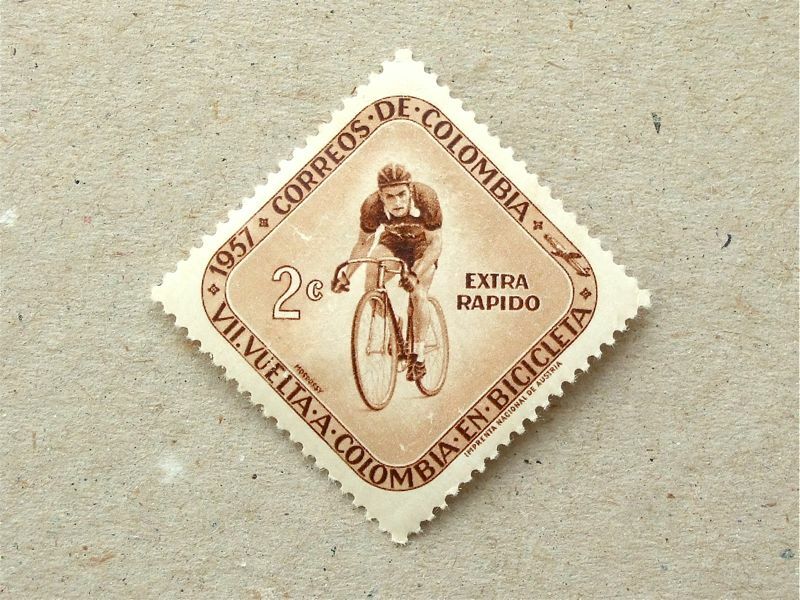 This Ecuador stamp is showing a cycle racer ( doesn’t it? ) in the style of their Inca god – in the form of a time trialist. I wish Thomas Voeckler had come at least third – he did really great, though. This stamp from Morocco for the Olympics in Rome shows the climbing moment – the strange shape of his mouth is maybe expressing the clenching of teeth! Arabic letters are dancing around this racer, supporting his effort – maybe? This stamp does not show the name of the rider pictured, but it is Eddy Merckx who won the World Championship in 1971. Shortly after the launch of this stamp, he also won the Tour de France of 1972, for the third time. On the contrary to this feature, I am enjoying the absence of the ‘superstar’ in the Tour de France 2011 – stage winners are honestly talking about the support they have received from team mates, and I like the modest comments by Thomas Voeckler, who has kept his Maillot jaune for nine days. I am now a great supporter of his – why not a French winner after 26 years of foreign riders winning? The sprint competition points system has been changed for this years Tour de France, which is making the tour more exciting to watch. Teams work hard to bring their sprinter to the height of speed to ride for the intermediate sprints – as well as the final few hundred of meters before the goal of the day. This year’s Tour de France is the 97th of its event. It started in 1903, suspended for 11 years at the World War Ⅰ and Ⅱ, then back on 1947. This set of stamps are celebrating its 50th event, issued from Monaco. Top one depicts scene in 1903, when every racer had moustache and carried spare tires in case of puncture, the second one is a cyclist in 1963, when helmet was not worn. I found an article in holga blog, collecting old photography of Tour de France, . Both stamps are beautifully engraved Intaglio, especially the first one is showing details of tool bag on handle bar, great effort on racer’s face and excited spectators with moustache! Tour de France has stared last Sunday, today was the second stage in Belgium. There were a few crashes last 2 days – the wet slopes are nasty for everyone. One of three leading racers Maarten Wijnants was flying off when they got in the cobbled road yesterday – he had showed off that he was Belgium! I was in Belgium at the end of June, took part in the Retro Ronde near Oudenaarde and cycled beautiful country lanes for 40 kilometers. There were a few cobbled path and had shaken all parts of my body. Belgium say ‘that is good for your health!’ but I don’t believe it – I had headache by wobbly eye sight. The Tour will experience the longest cobbled road of Trouée d’Arenberg, 2.4 kilometers long, tomorrow in the third stage. This stamp is from 1963, showing a close competition at a goal on cobbled road.